I thought potty training was going to be a great topic for me to blog about. It’s such a milestone and so many people are keen to share hints and tips that I thought I could take my learnings and inspire some other people! Unfortunately I don’t feel like this now as there hasn’t really been any real ‘training’. I thought I’d write about our experience though- maybe it will inspire me when it’s time for Arlo to ditch the nappies!!! So we have been thinking that Woody was ready to be potty trained since before he turned 2. He has always been very aware of when he is going to the toilet and as a baby hated a wet nappy. However, with both of us working full time and it being winter we put it off. We did buy a potty though and he would always have a wee in it before his bath, so he knew what to do. We then had Arlo and the thought of potty training was put to the back of our minds. We had made the move from nappies to pampers pants during the day, to try and encourage him to use the potty when he felt the urge, but this didn’t happen! Woody gets bad eczema, and at the end of May this has gotten especially bad, especially on his tummy and back where the top of his nappy sat. The weather was really warm which I don’t think was helping it, so on the bank holiday weekend, I spontaneously asked him if he wanted to take off his pull-up and put some pants on to try and help his skin. Once this decision had been made though there was no going back! The potty was placed in the middle of our kitchen/ living room and wee-wees happened very frequently. Our first ‘pant day’ was a Sunday, and we went through a fair few pairs of pants. On the Monday we visited family and so I put a pull-up back on him whilst we were out, but pants on once we got home. It started to feel like more wee-wees were going in the potty, with accidents only happening a few times as he learnt how quickly he needed to get to the potty. On the Tuesday, he went to nursery with a bag full of spare pants and clothes. When he came back all 5 sets of clothes were wet, but they said he had been really good. They said he was calling to go to the toilet every 5 minutes and would start taking his clothes of there and then! Another 2 days at nursery and the number of wet clothes reduced. By the following weekend it felt like he was ‘trained’ – although poo’s were another matter. Poo’s have taken slightly longer, maybe 3 or 4 weeks, to master. He definitely had a fear about having to do this on a potty or toilet. We had bought a toddler seat for the toilet, and tried to persuade him that this was to be used when he needed a poo. We would need to look out for signs that he was going to have a poo, and then quickly whisk him away to the bathroom. For the first few times he only wanted daddy to be with him whilst he did this, and needed to have a cuddle whilst sat on the loo. He has completely transformed now though and will take himself away to have them, and call for someone to come and sit on the side of the bath and chat to him – they have become social events!! We did have to use a bit of bribery to encourage the poo’s happening on the toilet – mini chocolate eggs were given in exchange. However, now all he needs is praise and a high5!! So as I said, I don’t feel like we trained him. We told him what he needed to do and he figured it out for himself. 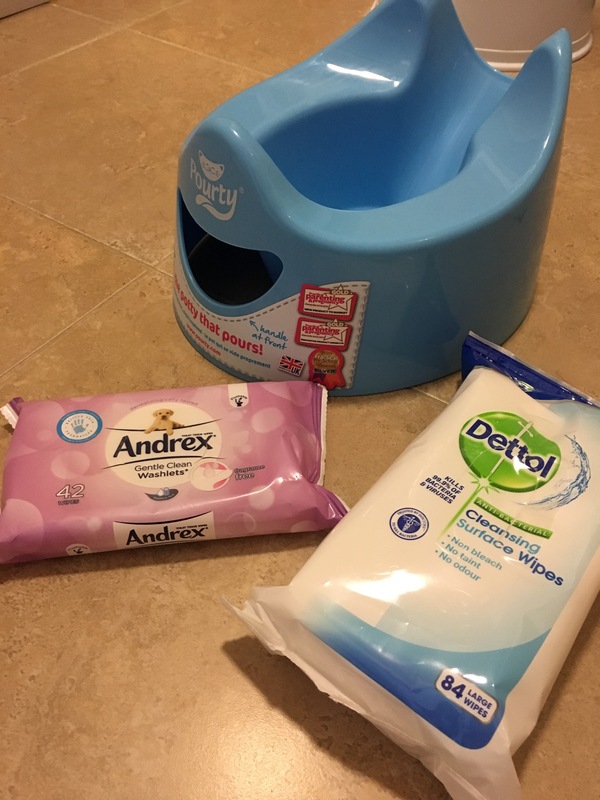 I have heard people talk about potty training in 3 days, and in our case I felt this was true as we saw such a difference after just a few days. He still wears a nappy at night, but I don’t think he is ready to lose this quite yet, so we will tackle that one as another point. I do think he was probably ready to move to pants earlier than he has done, and part of me wishes we had tried earlier, but he has done it now. patience – if it works it works, if it doesn’t we will try again soon. being relaxed – urine on your kitchen floor is fine!! and dettol wipes come in massive packs! Posted in Toddler. Tagged mum of two, mumofboys, potty training, pourty, Toddler.